Construction crews are hard at work at the GW Virginia Science & Technology Campus (VSTC) building three teaching labs slated for completion this spring. The project, valued at more than $3 million, will allow expansion of health science programs on Campus by the spring of 2015. This construction project expands VSTC’s available classroom inventory with 7,000 square feet of laboratory and support space. One of the three planned labs will be used for organic chemistry/chemistry and the other two will be equipped for chemistry, biology and physics. Each of the three labs will accommodate 24 students. 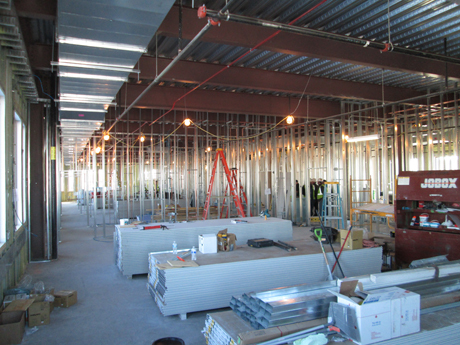 There also is support space being built out to accommodate faculty and student needs, including a fume hood room, prep room, a glass wash/refrigeration room and storage. The lead contractor, Whiting Turner, is constructing the labs and support space, which were designed by Cannon Design, in one of GW’s newest buildings. Currently known as the academic incubation facility, it is a three-story 21,000 square foot building located at 44930 Knoll Square in Ashburn, Virginia, and connected with a common lobby to a separate one-story 23,000 square foot building currently known as the collections and conservation resource center (CCRC). The CCRC is a state of the art support facility for The Textile Museum collections, GW's fine art collection, and the Albert H. Small Washingtoniana collection, comprising historic documents and maps related to the founding of Washington, D.C. The new labs are being built out on the second floor of VSTC’s newest building with funding from the GW School of Medicine & Health Sciences (SMHS), the Division of Operations and VSTC. The project emerged as an SMHS-sponsored Innovation Task Force (ITF) Initiative. The first user of the labs is expected to be the new SMHS Post-Baccalaureate Pre-Medicine Program, which prepares candidates for medical school. The one-year program will launch in May 2015 with a planned cohort of 24 students. The labs also will be used by SMHS’s Pharmaceutical Sciences program, which serves as a pipeline for students planning to attend pharmacy schools nationwide. The realization of the new wet labs being built on Campus has come to fruition through the efforts of many faculty and administrators at VSTC and the SMHS. Students will begin using the new infrastructure this spring, as they begin their journey towards joining the health science workforce.